I can't find anything on these forums so here goes another question from me. I want to unfold selected UV's but when I click unfold it unfolds all. I haven't figure out how to do this. So my question is how can I unfold my selected uv's without unfolding everything? In this image you can see the one I have selected if I click unfold everything unfolds which resets the ones I have already unfolded. Try selecting the polys you want to unwrap, in the 3d view window,then it should only unwrap the selected ones. You will always unfold the entire mesh if it is one piece unless you 'detach those polygons' selected after unfolding.. The best way I have found is to have shading domains. Once you have shading domains you can (uncheck the box in the display for UV) and then select that shading domain. You will still have to detach polygons. 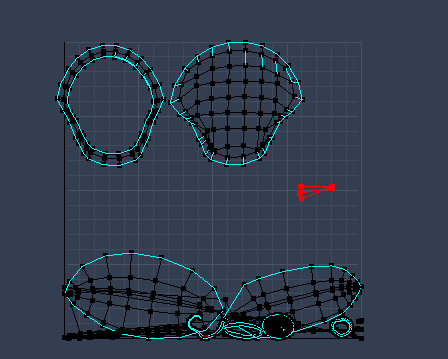 Either way, you want to detach those polygons, which in one mesh may be workable or maybe not suit your purposes. I just find it better to organize by shading domains myself. Shading domain doesn't work and it is already detached and I decided to see if I detached the polygon, but it didn't work. 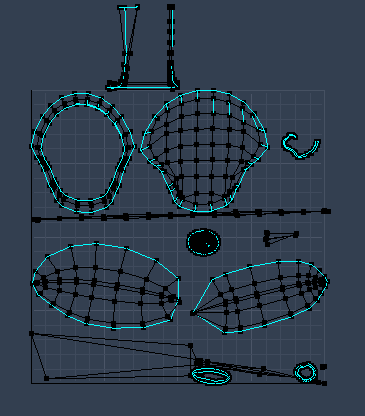 You can use the Scale, Rotate, and Move tools to reposition and scale the selection of polygons, so that you can layout a better custom UV template. and that usually gets you back to where you started,..
there's no easy answer,. because you're making a "custom" UV layout, and Carrara isn't smart enough to know the best way to lay out the separate sections for you. You need to manually Scale,. Move,. Rotate, the individual sections to create your ideal UV layout, ..then export that as a UV Template, to use as a guide to texturing. Trust me you can't fix this easily with scale rotate etc. I will go off and try something else though. Infinite Skills Advanced Techniques is a steal of a deal when it comes to modeling, mapping, animating, replicating, deforming through displacement, deforming with modifiers, 3d Painting, amazing shader techniques, what have you. It's truly an invaluable set of Carrara specific help from our own Phil Wilkes, a real Carrara experienced master. Do you already know how to create seams for the unwrapping process? Looks like it. Yeah, even with the seams, Carrara sometimes wigs out with unwrapping. I think 3DAGE is spot on with using the scale/rotate/translate tools. Grim, what do you mean by, "Trust me you can’t fix this easily with scale rotate..." If you elaborate on the problem, perhaps we can help out a little more. I know when I was doing a more complicated unfold the "re-unfold everything you meticulously corrected" got old *very* fast. It is a fairly annoying lacking that you can't have it unfold only a set of vertices -- especially when in different shading domains. There's no fundamental reason why that isn't possible. 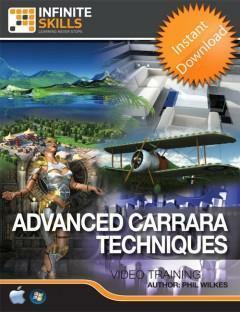 Its a limitation and, in the grand scheme of things that can be improved in Carrara where it falls. Another issue is making sure that different parts of the mesh scale consistently. I had that recently -- fortunately in my case being 'approximately right' was good enough. So, while I feel the pain of The_Grimreaper, realistically its something you have to work through in Carrara. Get all seams done, then unfold. If you have to re-do the unfold you have to re-do all the other work. That's just the way it is. It'd be nice to be able to export (not the bitmap) and re-import back in as some things could be handled easier by hand editing the coordinates. Or get a dedicated UV unwrapper.